The speaker in this poem describes the conduction of an old pensioner. 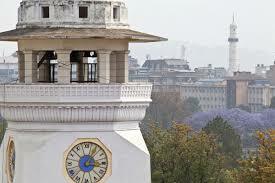 The poem has compared the old pensioned senior vet with clock tower, Ghantaghar. He is old, rejected and has distributed all his things to his relatives. All his military equipments are gone. The old pensioner has jealously too; so, he has kept two souvenirs of his army life. They are an old-modeled, large, round pocket watch and the ancient hat. The clock tower is like a pensioned senior vet who is passing t=long and sand days of the old age. It has a clock on its neck and a cap like the old vet on its head. It is standing forever on the bank of Ghantaghar and it is brooding. The loneliness of the old man is powerfully presented through the image of the clock tower symbolically. Like the clock tower which is old, neglected and waiting its end day, the old man has also the same fate- old, rejected and dejected. The poem has revealed the bitter reality of the old age. Ranipokhari was built by the king Pratap Malla in 1727 BS in the memory of his son. It was a token of consolation to his wife. Thus, by looking at the lake the old man remembers his past and is mollifying (lessening) his suffering. Time is most power full thing. It turns a handsome man to an old and ugly person who has nothing except memories. We all are victims of the time. The poem aptly points out the power of time. The vet is sitting under the tower, time, which itself is the curse of for human being. The poem has used the power of imagery in a powerful way. Without stating the history of Ranipokhari it invites readers to know why the old man is looking at the Ranipokhari, queen’s lake. Why does the poet compare an in animate object like a clock tower with a living human being? Why does he say that the clock tower is brooding? It is unhappy. How does he know? The poet seems to be very unhappy with our neglect towards tradition, historical monuments.In our life as well, when we grow older, nobody talks to us. We want to share our experiences, but nobody would have time to listen us. Thus we lament and curse time because it is time that changes us to an old and ugly things. We have to wait silently to death. We cannot stop the passage of time, time is powerful than us. We have nothing except lamenting on the bygone days. I met an old man in Pasupati area. He reported all his grief within five minutes to an unknown like me.